Do you ever have something that you know you HAVE to do in a certain time but you have no idea how to tackle it so you put it off and put it off, and then you’re nearly out of time and you just have to seize that nettle? Sometimes I see my challenge for my next Bee block and I know exactly what I want to do and how, and other times I get a total, utter mind block. Last month I was having a few problems with the cat until I realised I was over-thinking (I was also possibly procrastinating because I’m not a cat fan ;o) ) but this month has been a bit of a nightmare for Piece Bee With You. Kelly asked for blocks with the theme of cold and flu, along the lines of thermometers and medicines and so on, and to be creative with it. That was when my mental block hit… I was going to go with lemon and honey, but hadn’t articulated that, and someone else leapt in to pick it. Then I was thinking of boxes of tissues in some way, and yep, someone else made one like that. I thought I might still be able to get a lemon in there with some ginger, but that just wasn’t happening, and I was getting a little desperate as I reread the brief and noticed that chicken noodle soup was acceptable. Hmm, I think I can do a soup bowl, although I’ve never had chicken noodle soup in my life! Cue frantic drawing late last night and a pattern useable for this evening. To make up for the rather simple nature of this block, I added a bit of steam, as, obviously, it’s really hot… Hope it works for you Kelly! This is amazingly cute and clever!! Cool. I could do with some soup right now. Send it over please. how can you have never had any chicken noodle soup? you really should try it out, it is good! your block looks fantastic katy! Very cute 🙂 and a really interesting prompt too, well done! 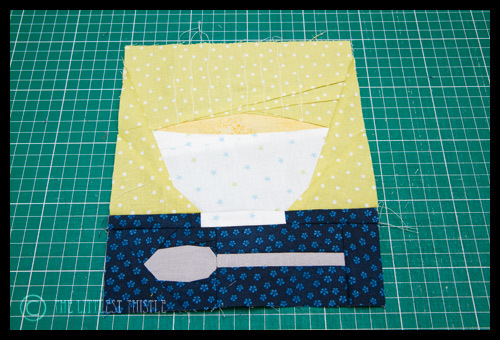 Can't believe there is such a thing as a chicken noodle soup block! I have never had chicken noodle soup either so will have to believe your interpretation. Like the steam! it's so clever! and adorable! i just can't wait to put this quilt together. PS. Never had chicken noodle soup in your life?!? I need chicken soup I am up to my ears in work and don't have time for my blogs, that I love reading. May be next week. The block is lovely. I wonder why no chicken noodle soup, ever? I love chicken noodle soup. There's nothing better if I'm recovering from an illness and I don't feel like eating. Great interpretation of the brief! Clever girl. Have I ever felt like that? Um. Yeah!!! I love your little bowl of goodness – I always work much better under pressure, or that`s what I tell myself! lovely it looks good !! enough to eat !! ok, forget the block, I am still stunned that you have never had chicken noodle soup! I thought it was a staple in every culture, in some form or another. Maybe that is what I need to bring to sewing summit! Now, back to your block…for never having had the soup you have done a great job with the block. It could also be porridge for a 3 bears quilt! You are the bear lady!